Alisha Bridges wasn’t always the confident young woman she is today. 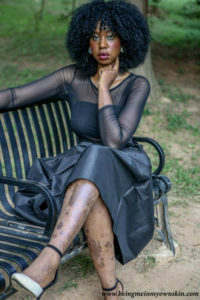 After being diagnosed with psoriasis as a child, she spent most of her life covering up her skin from neck to toes and hiding her condition from just about everybody. Now she’s a full-time psoriasis blogger and advocate who isn’t afraid of a mini-dress. Bridges, who writes about life with psoriasis on her blog, Being Me in My Own Skin, was only 7 years old when she was diagnosed with the persistent skin condition. Before that, her family assumed the patches on her knees and elbows were just dry skin. Alisha Bridges found confidence and community by becoming a full-time blogger and psoriasis advocate. Psoriasis, which is not contagious, is much more complicated than a simple skin rash. It’s a chronic autoimmune disease that speeds up the lifecycle of skin cells. As the cells build up on the surface of the skin they cause scales and red patches that itch like crazy and can sometimes be painful. Triggers for flare-ups include weather, stress, minor skin traumas, and alcohol. 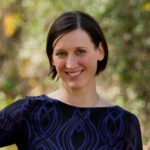 Bridges, an Atlanta resident who has a background in marketing and communications, has since won awards for her blog which includes everything from articles on self-esteem to resources for a variety of treatments. She encourages readers to find psoriasis specialists and seek mental health treatment if they’re suffering from depression or anxiety, which are often concurrent conditions. She tries to post at least once a month, and includes guest posts from other people with psoriasis. She has also made advocacy her full-time career, launching her own business called Health Media Consulting. She works with companies on social media as an ambassador and patient engagement specialist, and regularly travels to attend medical and health-blogging conferences. In February, she’ll head to Capitol Hill in Washington D.C. with NPS to lobby congress for research funds. For now, Bridges has found a biologic medication that’s dramatically reduced the frequency and severity of her flare-ups. If that stops working, she’ll do her best to find another treatment that does. But no matter what, she has the self-esteem and confidence to deal with whatever comes along. And she wants to help her fellow psoriasis sufferers feel just as strong. We have opportunities to share your health experiences including feature videos, advocacy programs, and more. Learn more and sign up!